If you had any doubt of the BIGness of the Sarah Palin story … it has affected me. 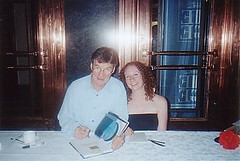 This innocent little Flickr pic of my sister Sarah meeting the wounderful Michael Palin has allova sudden had 14,113 views (and still rising. What a giggle. Suggest we check the Alaskan address?